I have learned something today. The manuscript I am close to sending to the printers has come to a total of 218 pages. I have decided to go for litho printing (minimum 300 copies) rather than Print On Demand, because this reduces the cost per copy. This in turn increases the chances of at least breaking even after subtracting postage and/or discounts. So far so good. I get an estimate from the printers quoting for 216 pages. When I point out that I have 218 I am told it is either 216 or 224. It has to be evenly divisible by 8. I spend the day killing a few more darlings and re-setting the text. I am on the last few pages when I get a further estimate from the printers for both 216 and 224 pages. The estimate for 224 pages is shown as a good £100 less than the 216. I thank them, say I want to go ahead with 216, but they have got their figures the wrong way round, and I finish resetting the text to 216 pages. It would work out cheaper to produce the 224pp as this would consist of 7 x 32pp sections, whereas 216pp would have 6 x 32pp sections, 1 x 16pp section and 1 x 8pp section. The extra plates and folding in production would therefore make this more expensive. Got it? I can’t face re-setting the text yet again, but I have added pages front and back with some lovely spaces to create an MS 224 pages long. I am a wiser self-publisher than I was this morning. A sunny interloper in the vegetable plot. A lovely cosmos Chocolate given to me in memory of a friend. This entry was posted in Gardens, Reading, Writing notes and tagged Cosmos chocolate, litho printing, POD, print on demand, printing, self-publishing, sunflower by hilarycustancegreen. Bookmark the permalink. Thanks Pierre, I long ago concluded that bloodymindedness is the baseline qualification for an aspiring writer. I would have been tearing my hair out! I find even formatting a blog post the way I want takes so much time… It’s interesting to hear the “behind the scenes” stuff to your writing. I have to admit to some hair-tearing-out in the course of the last few weeks. I agree formatting a blog post the way you want it is sometimes maddening, but most software on a Mac is a doddle compared to that and I like playing with words or I wouldn’t be in the game at all. I have to admit to not being able to follow all of that, and it wasn’t due to your writing! Hilary-tenacious-Custance Green. I had to read it several times and then do some mental origami. Incredible how you stay so calm. At least you will know next time. There will be a next time, won’t there Hilary? I fear there will be a next time. I am at the stage with Border Line of feeling that I missed my intended vision by a long way… so I will have to give it another go. LOVE the cosmos, Hilary – they are simply gorgeous !!! As to the printing … words just about fail. I can add only that I’m glad I never had ANY money to consider that; for I don’t have even 5% of your patience and practicality. Yes, I am bowled over by the rich colour of the cosmos every time I see it. I don’t know about patience, but yes, I’m practical. Though on the whole this is more use for putting up a shelf than publishing a book. You’re a DIY Hilary, then ?! I read from one of your comments that you are giving Border Line another go. That’s great. It’s a terrific story. 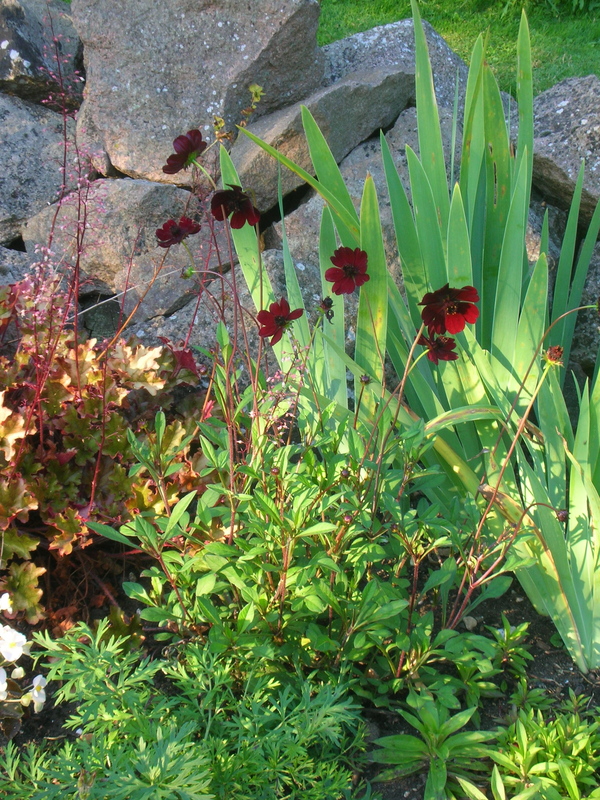 Lovely photos of your garden. Yes, it was like Christmas suddenly having all these extra pages. As suicide is a theme in Border Line, I have been able to include mention of The Samaritans on a spare page, and so on. I’m thrilled you are reading Unseen Unsung. I MUST read the Goldfinch. A friend who read chapters for me when I was writing Unseen Unsung (2004/5?) sent me a copy months ago, and others have noticed the resemblance, but something keeps stopping me from opening the book (possibly its length!). I’m sure it’s a case of curious minds thinking alike. I often find stories in newspapers, as I’m sure you do, that seem to be based on something I have written – very unsettling. I love sunflowers so cheerful, my friend Danielle just had them in her wedding bouquet, I’d not seen them used in bridal bouquets before, they looked fabulous, I wonder if they dry well and hold their colour? Not sure they dry, except as seed heads. Though I dried the pearls of some special roses in the oven and I still have them. 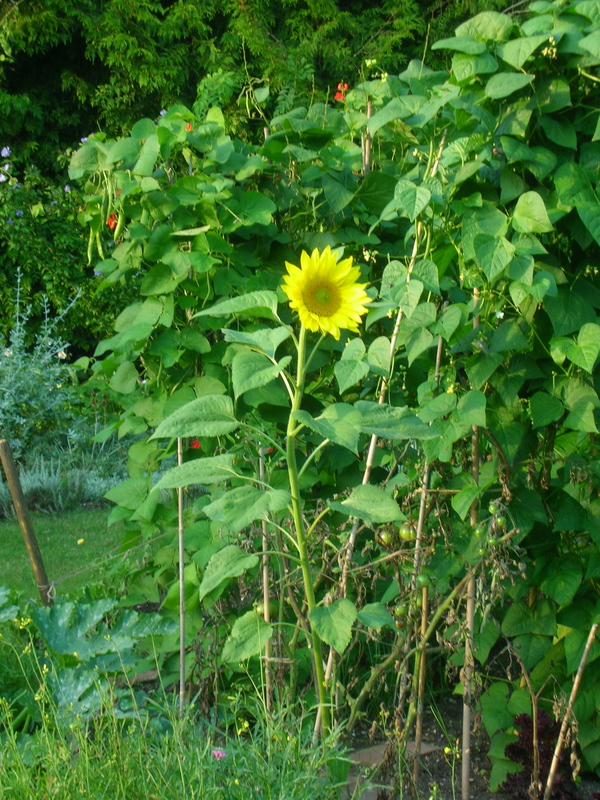 We leave our sunflowers for the birds (who planted them in the first place).